San Quintín, Baja California – Due to a wave of violence, hundreds of Triqui women from the state of Oaxaca have abandoned their lands to start a new life in the north. Women who were widowed as a result of community clashes fled from death with their daughters, sons and partners, to the state of Baja California (BC). In conflicts for control of the Triqui territory, women are the cannon fodder. In BC, they founded what has been called the New San Juan Copala, a district of San Quintín in the municipality of Ensenada in BC. The name of the district refers to the town in which people fled from violence in the Mixteca region of Oaxaca. Juana Ramírez is originally from the town of Cumbre Hierba Santa in San Juan Copala and she arrived in Ensenada in 2000 because “I was afraid to die” in the community, as has happened to dozens of women from her town. Her home town is one of the 23 municipalities that make up Santiago Juxtlahuaca, Oaxaca, located in the Mixteca region, west of the state capital. The municipality, located in the lower Mixteca region of Oaxaca, has had political and social conflicts over 30 years that have resulted in at least 800 violent deaths of women and men, girls, boys and adults alike, according to estimates by the administrative committee of the Cultural House of the Triqui Nation “Heriberto Saúl Pazos Ortiz”, who have taken refuge in the city of Oaxaca. Before the conflict in the Triqui region became more acute, Juana Ramirez, now a widow, left her land and travelled to San Quintín to start a new life. In just the last four years, the town of San Juan Copala, where the majority of the conflict exists, lost 70 percent of the female population estimates Lorena Merino Martínez, who now lives in a camp in the corridors of the Government Palace in the state capital. Until 2005, the number of inhabitants in San Juan Copala was 786, of which 333 were men and 453 women. 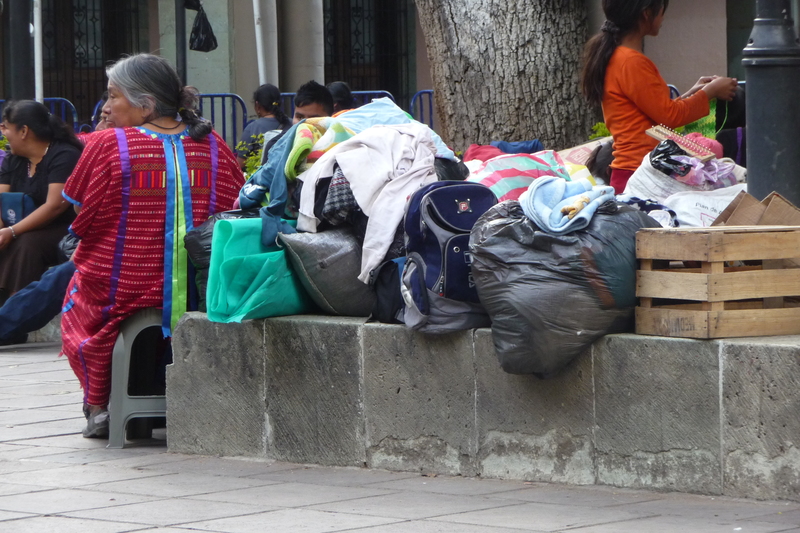 From 2009, the exodus of the majority of the women began, many of them widows who migrated to Mexico City, Mexico State, Baja California and the city of Oaxaca. Currently the exact number of women who remain in this population is unknown, as in 2010 INEGI (the National Institute for Statistics and Geography) suspended the Census of Population and Housing due to the lack of security. According to Lorena, who lost her husband during a shoot-out in San Juan Copala, women and children are the most vulnerable as they are often violated and then assassinated. In addition, since 2009 they have been left without doctors, medicine or teachers for their children. Juana Ramírez is currently a day labourer, midwife and traditional healer and she is considered a wise woman because of her knowledge of traditional medicine. With her work in the countryside of San Quintín, she bought a piece of land from the government of BC so that Oaxacans could set up residence and remain active in agricultural and commercial activities in the valley of San Qunitín. The neighbourhood is located in the municipality of Vicente Guerrero. Here at least 20,000 Oaxacans, concentrated in 30 neighbourhoods, have settled, with Triqui and Mixtec people in the majority. Women represent 55 percent of the population, according to the municipal delegate Justino Herrera Martinez, who is also of Triqui origin.